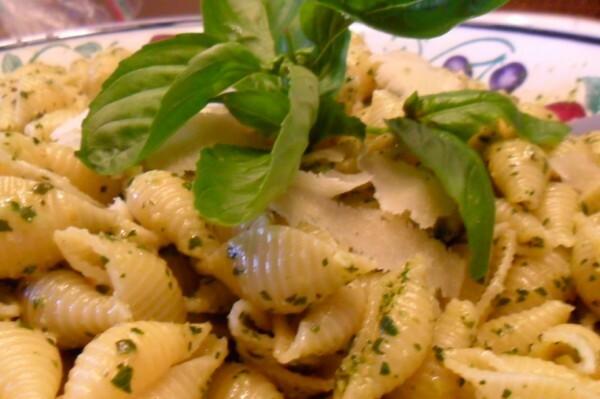 Pesto originates in Genoa, in the Italian region of Liguria. The name of the uncooked sauce comes from the Italian verb pestare, which means to pound, or to crush, a reference to the traditional mortar and pestle method of preparation. Although many recipes save chefs an arm workout by substituting a food processor for the mortar and pestle, the traditional ingredient list is usually the same: basil, garlic, pine nuts, olive oil and Parmigiano Reggiano cheese for a fresh-tasting sauce perfect for tossing with hot and cold pasta or slathering on panini and bruschetta. But while pesto may be rooted in Italian tradition, there is nothing prohibiting cooks from getting creative with the recipe. By simply learning the basic ratio for a pesto, you can create a multitude of sauces. Parsley, spinach, arugula and cilantro (for those that actually enjoy it) are all acceptable herb substitutions for the basil — you can even go as far as using radish leaves for a sophisticated and resourceful variation. Arugula adds a refreshing and unexpected peppery bite to the sauce. Instead of pine nuts (which are notably expensive), consider walnuts or almonds, or even pumpkin seeds. In addition to the nuts, cheese in the pesto provides a salty flavor, so potential swaps for Parmigiano include Pecorino Romano or Manchego. Like the cheese, garlic serves as an aromatic flavor boost to the sauce, but you can also use minced chopped onions, scallions or shallots. Blend everything with oil, and then you have a simple and savory sauce with as many uses as it has variations. In the bowl of a food processor, combine the herbs, cheese, nuts, and aromatic. Process until herbs are chopped and combined with other ingredients. Then, with the processor running, add oil in a thin, steady stream, until it reaches your desired consistency (less oil for chunkier sauce or more oil for smoother sauce). Transfer pesto to a bowl. If making in advance, be sure to cover the top of the pesto with a thin layer of olive oil to prevent the pesto from darkening. The sauce can also be frozen in the same way for use at a later date.